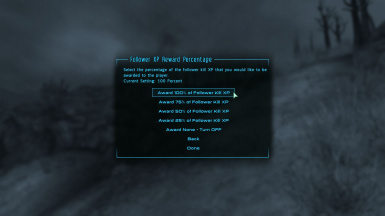 This mod awards XP to the player for follower kills, similar to New Vegas. This mod is Nexus Exclusive - you may not re-host this mod on any other site, without permission. You may pick apart my scripts and use ideas in your own mods. If you use a substantial amount of it, some credit would be appropriate. Translate to other languages - send me a pm and a link to the site where you want to host it. I've always given the ok for this, but I would like to know. 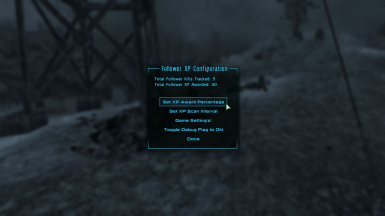 This mod scans for dead actors and awards XP to the player for follower kills, similar to New Vegas. Optionally award 25, 50, 75, 100 percent of this follower kill XP to the player. Your followers have to be with you, of course. This mod reads gamesettings and the difficulty setting to compute proper XP, it IS compatible with any mod that changes XP rewards through these settings. 1. Install with NMM or FOMM. Or just copy RHKFollowerXP.esp to your data folder. 2. Activate the plugin in your mod manager. 1. 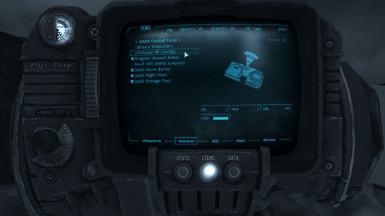 Launch the <Follower XP Config> item in your Pipboy's Apparel tab. 2. Select 'Game Setting(s)', then 'Reset to Vanilla - 40 percent'. Then save your game. 3. Remove RHKFollowerXP.esp from your data folder. 1. Set XP Award Percentage - only award the player a percentage of follower kill XP. Selections are 0,25,50,75, or 100. Set it to 0 to turn it off temporarily. 2. Set XP scan interval - Default/recommended setting is scan every second, but you can increase the interval if you have a heavy mod script load and are concerned about performance. 3. Game Setting(s) - iXPDeathRewardHealthThreshold - This value is the percentage of health damage that you must cause to an actor in order to be rewarded XP for the kill - regardless whether you fired the final kill shot or not. This game setting really has nothing to do with actually tracking follower XP - more of a game play mechanic, but it's value can have an effect on the amount you are awarded if you are in pitched battles that have friendly, non-follower actors. Even so, I recommend leaving the value at vanilla 40%, but it's here if you want to fiddle with it. 1. It is assumed that any XP that the player has gained, that can't be accounted for by the scanning script, is due to the player causing more than iXPDeathRewardHealthThreshold to an enemy, and therefore the game rewarded the XP. 2. It is also assumed that the actual killer in the above situation is a follower, so this excess XP is subtracted from the potential extra follower XP reward. 3. As a result of 1 and 2, the extra Follower XP awarded by this mod may be less than what you are due, if the killer is actually a third party friend or enemy. There's no way to read iXPDeathRewardHealthThreshold on a particular actor, so the script errors on the side of not giving enough extra XP, rather than too much. 4. In any event, you will always get at least the XP that the game engine thinks you should get - that bit is not affected by this mod. This mod just gives you extra XP. 5. Other activities, such as hacking, lockpicking, location discovery during combat can also subtract from extra follower XP. But realistically, the impact of these situations is going to be trivial over the long haul. 1. This mod is technically incompatible with any mod that changes iXPDeathRewardHealthThreshold. I don't know of any mods that change it, but you could set the value close to what the other mod does so the difference would be trivial from a game play perspective. 2. If you have my Brisa Almodovar mod, version 1.25 installed, go into her options and turn off the XP reward for Brisa's kills and let this mod handle it. Version 1.30 (not released yet) will auto-detect this mod and not interfere. 3. This mod is not compatable with any mod that tags dead actors with the RadiationRad Actor value. 4. Since this mod reads gamesettings to compute proper XP, it IS compatible with any mod that changes XP rewards through these settings. 3. Both of these settings revert to off when you exit the game and re-launch. Fallout Script Extender (FOSE) by Ian Patterson (ianpatt), Stephen Abel (behippo), and Paul Connelly (scruggsywuggsy the ferret). This mod would not be possible without it. With this mod loaded, as with any other mod, it's possible your computer will spontaneously combust, trigger a real nuclear war, or worse yet - cause your save game to be corrupted. Use at your own risk.